A friend once gave me an Australian scone recipe his Mom used to make him in the land down under. 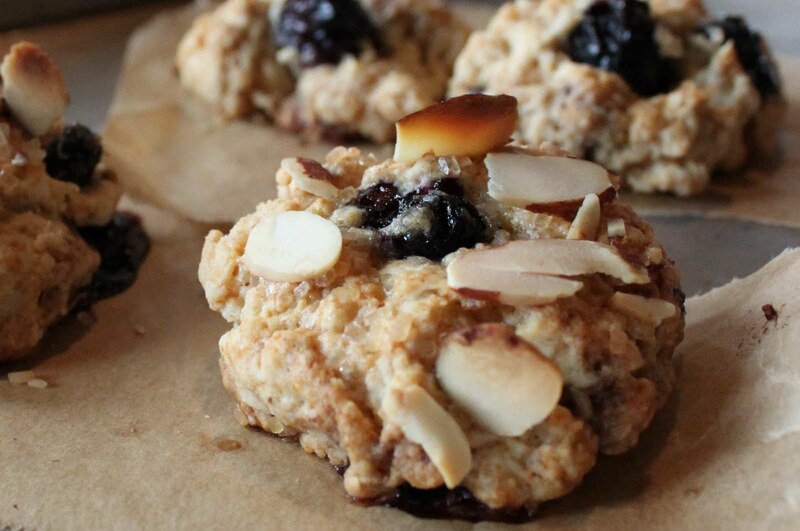 It's quite a simple recipe that's more like a basic biscuit than American scone. I have to admit -I'm not a huge fan of these American scones often found in chain coffee shops as they are typically dry, hard and tasteless; a well done, flavorful biscotti fills that need for me. 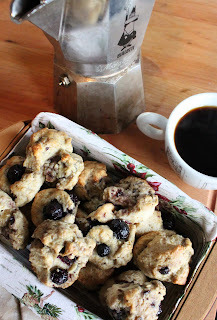 Most of my own scone recipes create a much lighter, fluffly scone. The question for you is, how do you like your scone? I liven up this basic Australian scone recipe by mixing a blueberry jam in the layers of the dough along with fresh blueberries. The addition of the jam intensifies the flavor profile of the blueberries for a super burst to your senses. There are two ways to make the scones, either pat out the dough or just scoop mounds out of the bowl for a more rustic look. I like to make tiny scones, one or two bites allowing me to eat more than one; choose the size that works best for you. You will love these scones- Australian or not! And if you really can't get past the idea that scones should be dry, hard and tasteless, then just call this an Australian blueberry biscuit instead; no reason to jeopardize a fat and happy morning over the naming of a food. Tips and techniques: Do try mixing and matching berries and jam, an apricot jam with blackberries or raspberries with a mint jam would be sensational. Turbinado sugar is brown in color and the grains are larger; you can substitute regular white sugar if needed. Sift the flour, baking powder and salt into a large bowl, add 4 tablespoons of the sugar and the butter, using your hands work the butter into the flour until all the butter clumps are worked in. Slowly add the milk, a few tablespoons at at time. Depending on the humidity level, you may not need to use all of it. Continuing to use your hands, work the dough just to the point of being able to knead it, careful not to get the dough too wet. Decide if you will pat out the dough and use a cookie cutter or if you will make more rustic, drop scone. If you decide to do a simple drop scone, add the blueberries and jam to the dough and mix lightly. Use a spoon to scoop out a small ball of dough, drop it on a cookie sheet lined with parchment paper (if you don't have parchment, simply grease the baking sheet). If you decide to pat out the dough, pour the dough onto the counter and pat out to about 1 inch thickness. Spread the jam and the blueberries across the dough, fold the dough in half and re-pat it out to about 1 inch thickness. Use a cookie cutter or a small glass to stamp out the scones, place the scones on a parchment lined cookie sheet. Some blueberries may fall out- just pick them up and push them into the scones. Brush the top of the scones with milk, sprinkle with the raw sugar and sliced almonds (optional). Bake at 400 degrees until the scones are golden brown; approximately 15 minutes depending on the size. These look yum! Thanks for sharing! !